Emmy here today with brand new cards to share with you! When I saw BoBunny's Early Bird collection the first thought that crossed my mind was "Tea Party, Birthday party or just PARTY". So, I decided to create cards that can be used as invitations, as any occasion cards or just for decoration. For my card bases I used plane white cardstock. I cut off a 14 x 28 cm stripe and a 15 x 21 cm stripe, folded them in half to create the blank cards. 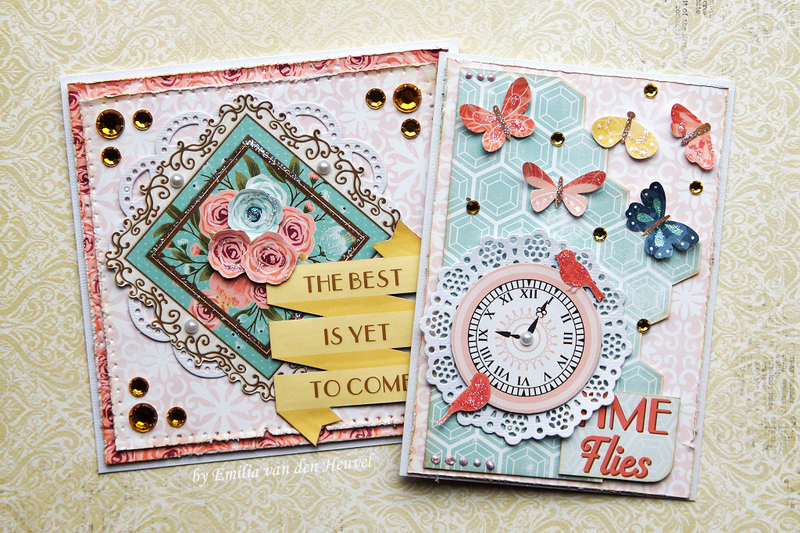 For the colourful layers I used various pattern papers from the Early bird collection. Before adhering the layers together, I inked and distressed their edges. For the sentiments, I fussy cut different embellishments from pattern paper and I used pre-cut ones from the Noteworthy pack. To finish off my design I added die cut paper doilies, glitter paste and rhinestones.